Helsinki’s “mobility on demand” system will integrate a variety of transport options and could make car ownership obsolete. Photo by Justin Swan/Flickr. Helsinki, Finland and Hamburg, Germany are both striving to vastly improve urban transport in less than a generation. The Helsinki Times boldly states that “the future resident of Helsinki will not own a car.” Hamburg, meanwhile, has announced a plan to create and link 27 square miles of green spaces throughout the city. Angelika Fritsch, a spokeswoman for Hamburg’s department of urban planning and the environment, told The Guardian, “In 15 to 20 years you’ll be able to explore the city exclusively on bike and foot.” Both cities are pursuing the ambitious goal of people-powered mobility that, if successful, may catalyze other cities to transform integrated transport and overcome car culture. 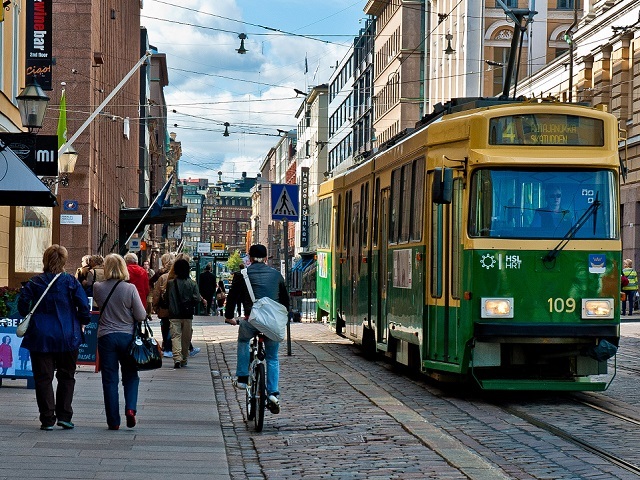 Helsinki, Finland’s capital and largest city, is planning to revitalize its public and shared transport network by 2025 with a “mobility on demand” system. The goal is to provide an array of transport options that are cheap, flexible, and well-coordinated in order to be competitive with private car ownership. A smartphone app would function as both a journey planner and one-stop payment platform. Users would input an origin, destination, and preferences to receive a customized transport plan that combines buses, bikes, ferries, and driverless cars. The app would also enable users to purchase this mobility in real time. There are a few caveats for Helsinki to consider. Accessibility to this new and improved system may be limited to those who can afford a smartphone and are comfortable using it. Finding the right balance between supply and demand will also be important. The system may be strained when, as the Helsinki Times puts it, “simultaneously everyone wants to take a taxi home from their Christmas party.” Additionally, this transport scheme may prove to work effectively in compact Helsinki, but it remains to be seen if the system is applicable to lower-density municipalities. Hamburg, Germany’s second largest city, announced in the past year that it is planning to make a greener, healthier city that would eliminate the need for cars within the next 15-20 years. Angelika Fritsch described the city’s plans to add green space by differentiating them from similar efforts: “Other cities, including London, have green rings, but [Hamburg’s] green network will be unique in covering an area from the outskirts to the city centre.” The proposed Green Network will create pedestrian and cycle paths to connect green spaces that cover roughly 40% of the city, including parks, playgrounds, sports fields, gardens, and cemeteries. Creating a network of green spaces throughout Hamburg will allow people to enjoy nature and recreation in the city and reduce the need to drive outside the city for a weekend excursion. Hamburg is already feeling the effects of global climate change. In the past 60 years, the city has seen a median temperature increase of 1.2 degrees Celsius and sea levels have risen 20 centimeters. Storm surges could also increase another 30 to 110 centimeters by 2100. In addition to reducing the need for driving, the expanded green spaces and new green paths will help absorb CO2 and alleviate flooding. Many in the mainstream media are wary of the idea that a city could go completely car-free given the rise in car culture since the introduction of the automobile. Achieving an entirely car-free city is a difficult task, but some cities, like Fez el-Bali and Venice, have successfully rebuffed cars and maintained pedestrian-focused transport. The Medina of Fez el-Bali is an old walled city within Fez, Morocco. It is considered to be one of the largest car-free urban areas in the world. With very narrow streets and a population of 156,000, the primary mode of transportation is walking and goods are moved with the help of donkeys and carts. Venice, Italy is Europe’s largest car-free urban area. Road and rail facilities are limited to the northern part of the city. Transportation throughout the rest of the city, and especially the historic center, is supported by walking or boating amongst the city’s 400 bridges connecting 118 islands. The 4,300 person neighborhood of Haenggung-dong in Suwon, South Korea also went car-free for a month when it hosted the EcoMobility World Festival in 2013. While the festival initially faced opposition, many residents grew to prefer the ecomobile lifestyle that led to reduced noise levels, improved air quality, and was a boon to local businesses. With urban growth on the rise, cities have a unique opportunity to be not only economic hubs, but greener, more mobile environments. Providing integrated “mobility on demand” like Helsinki and interconnected green spaces like Hamburg allows people to efficiently and actively experience their city without depending on a car. These innovative strategies provide examples of how cities can combat climate change while also improving citizens’ quality of life.